My gorgeous son Jesse already knows that he wants to work with tools when he is older as a Heavy Diesel Mechanic. So for his 12th Birthday we decided to buy him his own Sidchrome tool box as he keeps complaining he has no where to put the tools as they were overflowing the tool bag he has. So of course instead of picking an easy cake my crazy brain thinks yep, I will make him a matching Sidchrome tool box cake!! I spent quite a while researching the tool box getting dimensions, drawer height, handles, key lock etc and taking pics for reference. 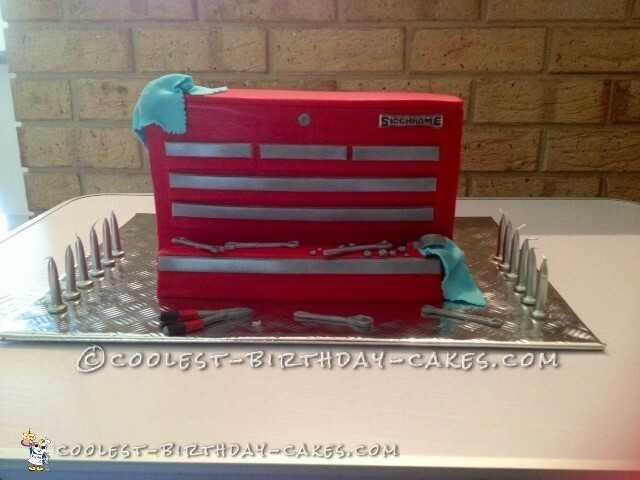 The cake is 2.5 times smaller than the actual tool box. Jesse’s favorite cake is red velvet so I made two slab cakes and layered and trimmed them to size stacking and using white chocolate ganache between the layers. Once the correct size I trimmed the size until straight and ganached leaving to set. I then rolled out red fondant (which I hate using high colored fondant and its extremely soft) and carefully laid over the cake and smoothed. Using smoothing tools to get sharper edges. I premade the drawer handles with grey gum paste and sprayed with edible silver paint once dry. The same as the handles for the side and key lock. I rolled out red fondant and using a roller cutter cut the drawers and stuck in place with gum glue. The very bottom drawer I used left over cake and modeled ganached and covered with fondant and then put onto base board. The base board I covered with checker plate contact bought at our local Kmart store. I finished embellishing the cake with premade little tools (mallet, ratchet and sockets, pliers, spanners etc) which were made out of gum paste and painted. I made two rags out of blue fondant and rubbed into the silver over spray to look like grease. I showed a few friends the picture on my phone and they asked “why are you showing me a toolbox?” They then realized who they were talking to and yes it was a cake! And of course the most important thing… my son loved it !